A good place if you just go for the beer, the Winter beer was my favourite but the others are equally tasty. I would recommend going early and getting in for free. It eventually get pretty busy and they then start to play music. Service is okay-ish, though we stopped from buying a round of drinks by the waitress (we thought it was a favour) but they then charged us 75p for the privelege. Go for the beer though! Modern bar with attached (visible) microbrewery just off Oxford Street. Had reserved signs on almost all tables on Saturday night, (we just sat down at an empty one anyway - nobody seemed to mind), and tried a sample tray of 4 beers for �3.20. I thought the quality was pretty good, with the Blonde and dark lagers being the best. Worth popping in for a quick drink, but this is not really the kind of place I'd personally want to stay all evening. I turned up here last night (Friday 20th October) to join my friend, who was there on an office party. Already, I was not allow in quickly to check that he was indeed there as he unfortunately could not here his mobile due to the music, which was crap by the way. When I did find him, I proceeded to the bar get get a round, to find what can only be described as one of the messiest and most unorganised bars I have ever seen. When I finally got round to paying, the barman was unable to locate the card machine, I think it took him at least 10 minutes. Once I finally accomplished the near impossible mission of ordering a round of drinks and paying for it, I start to proceed slowly to the back to where my friend and his colleagues were, only to have someone walk backwads into me and spill half my drinks. Obviously I gave the person a slight nudge to let them know I was there, and got accused of rudely barging through. I kindly explained that they had split half my drinks and that I was trying simply to save the other half. It transpired this woman was one of the patrons of the bar, and that this miserable person descided to wield her power and have me kicked out because she split my drinks!!! One of the bouncers kindly asked me to come outside for a chat, and having worked in the bar industry long enough knew exactly what that meant. As everyone knows there is no point in trying to debate with a bouncer so I asked if I may just pick up my umbrella, having come straight from work, and was immediately told this was no possible! In short the patrons of this bar will kick out cash paying customers just because they have had a tough day! Maybe they should have a few courses in customer services! I will never step in here again, and I advise visiting some of the much finer establishments the west end has to offer, trust me there are a lot of them! 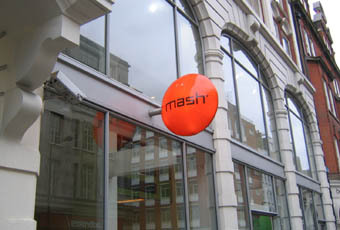 Mash was one of the greatest dissapointments of my drinking career, but deserves one star for being the first place I have ever been kicked out of in my 30 years of existance! At least now I know what it feels like! Deadly house-brewed beers at this funky bar that gets going pretty early in the evening. Highly rated on the blurr-ometer - its a blurr where I left my phone and how I got home, and its a blur where my mate left his Ukraine-girlfriend.